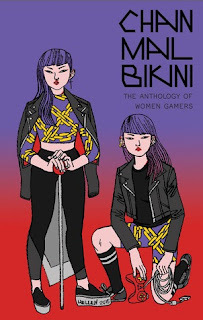 We unfortunately live in a world where Chainmail Bikini's theme as an anthology (women's gamers) is a political statement. Unfortunately, in the wake of unrelenting hostility, misogyny and out-and-out threats on women who happen to play and write about video games, a public admission of being a gamer is an act of bravery. Indeed, that was one of the primary statements of purpose during the book's Kickstarter campaign. The book is a way of saying that gaming isn't and shouldn't be something that's reserved only for men, that there are a number of women who enjoy it, and that gaming communities shouldn't be hostile environments for women. In that sense, the book's existence makes it an unqualified success. At the same time, it's also that most unpredictable of comics phenomena: the open-call anthology. For an editor and a project like this, it's difficult to turn down earnest contributions. Unfortunately, the resulting 200 page anthology was far too long for such a specialized subject and a wide variety of skill levels on display. The resulting read can be a slog, because while everyone's story is slightly different, there are too many stories and approaches that overlap in terms of style and intent. 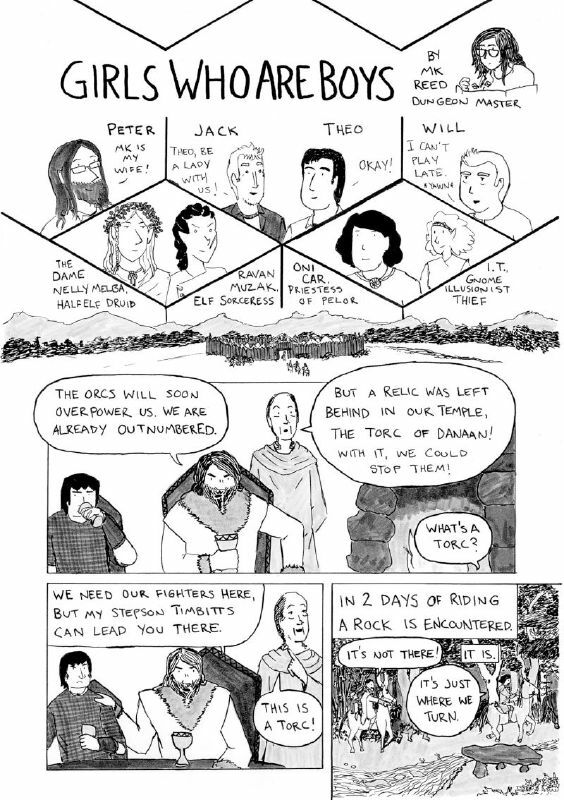 For example, one often-used narrative trick in the anthology talks about how important video or role-playing games were or are to them, and then draws the characters from a campaign having an adventure. Katie Longua, Anna Anthropy/Jeremy Boydell, Anna Rose, MK Reed, Becca Hillburn, Diana Nock, Liane Pyper, Sarah Stern and Jade Lee all did this, to a certain extent. 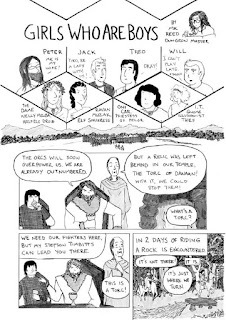 Reed's was the sharpest written of the bunch, since as the Dungeon Master she took an all-male group of players playing an all-female group of characters through an adventure that had hilariously menstrual overtones. Stern's story involved a new DM in an established group of guys who stood her ground with them while giving them the best adventure they'd ever been on. 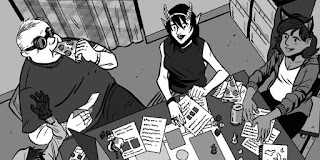 Hillburn's story was sharply-drawn, featuring the ridiculous character of "Pretty Paladin Critical Missy" hogging the spotlight, as the other players accused her of grandstanding. Starting the story with the fantasy narrative and only switching over to the players later on was an especially effective technique. There were several stories involving gender, identity and how gaming affected it. 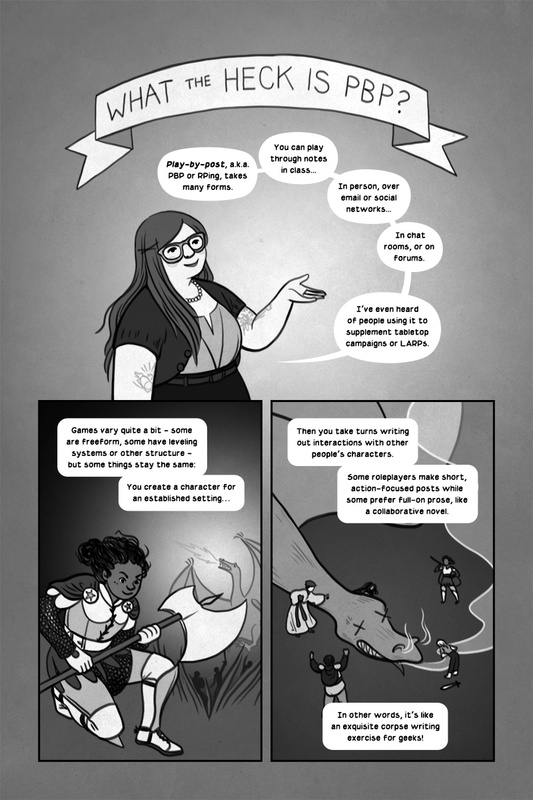 Anthropy's story touched on it, but the visuals for the story simply weren't up to portraying how magical the game she played was for her and the digital lettering was distracting. On the other hand, The K.A. Kelly-Colon/June Viganis collaboration about a teen boy realizing that the female monster character he played in a game felt more like the real version of them than their birth gender uses clever page design choices while getting across the message. Kori Michele's story is a rant against the way many handheld games demanded that you enter your gender before playing, especially as a person who was "deep into my gender confusion". Some of the best stories addressed gaming and mental health. Jane Mai's "Ikachan" is remarkable in the way it incorporates the bizarre game Mola Mola's suicidal aspects and how she connected it to a memory of learning how to swim. The scrawled text and lush images are quite affecting. Elizabeth Simins' "Manic Pixel Dream Girl gaiden: guitar heroine" details the artist's experience with Obsessive-Compulsive Disorder and helped distract her from her increasingly paralyzing OCD events that often revolved around death. There's no happy ending here, just a depiction of the struggle. Caitlyn Rose Boyle's exquisitely-drawn "Connections" champions the idea of video games as a way of moving the mind away from depression, even if they are "sweet and silly things". Her linework and lettering are crystal-clear and confident, as she makes extensive use of negative space to highlight those figure drawings. 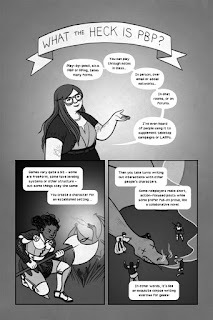 Sera Stanton's strip is about how she thought healers were pointless video game characters but how she wished she could do it in real life; her pages suffered from clutter that made them difficult to read. Several stories dealt with sexism and misogyny head-on. Maggie Siegel-Berele's story talks about the slow progress being made in reining in misogyny and creating safe spaces for women and LGBT folk in Live Action Role Playing (LARP) communities in a straightforward, somewhat didactic fashion. Laura Lannes' strip about the feminist implications of the game Portal is a master class in deconstructing the symbols of a piece of culture and revealing its meanings in addressing the concept of patriarchy, although I wish the visuals had been a bit less bland. Sarah Winifred Searle's story about misogyny in the play-by-post role-playing community is pointed in its use of real-life examples, smoothly-designed and honest about the positives and negatives to be found in her pursuit. A number of stories were simply about how the artist felt alienated from others until they found gaming, and then they had the sense that they found their people. Molly Ostertag's LARPing story from her teen years puts a clever spin on it by making it a third-person narrative, retaining the lessons she learned and confidence she gained in her schooling and career. Rachel Ordway's story is about how making up a game with her brothers bonded them over a summer, while Natalie Dupile's is about how a LARP variant at a summer camp brought people together because it didn't take itself too seriously and allowed for a lot of free expression. Kate Craig's story is another one about LARPing that involves romance; it's rather straightforward but with expressive figurework that carries the thin plot. Yao Xiao and Kinoko Evans both did strips about growing up and turning to video games for support, confidence and even personal growth. Yao's strip talks about having parents disapproving of gaming. 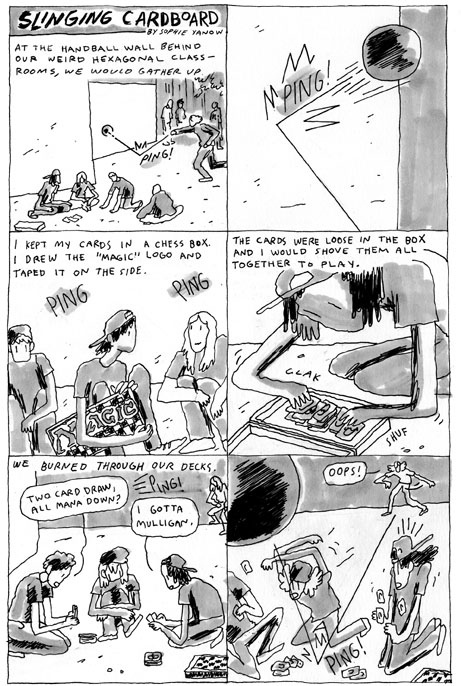 Newlevant touches on that subject with a strip about playing a dumb hack-and-slash video game but loving it because it was a particular kind of bonding experience with friends. 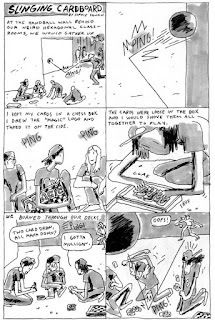 Amanda Scurti's strip about pretending to avoid doing violent things on video games with her mother was hilarious, especially as a moment of self-reflection about enjoying violence ended with her gleefully going along with her brother to look at a violent game. Sophie Yanow's story is less about gaming as identity and more about her group fluidly accepted gaming as just another thing they did. 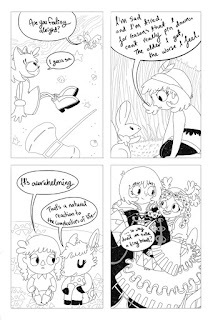 Newlevant's other strip pointed to the idea that she could do an entire book of stories like this on her own as an autobiographical device, because her other story was completely different. That involved playing Vampire: The Masquerade and having to play a seduction on a non-player character--which essentially meant role-playing a seduction with her GM. It's a funny story that has just a tinge of the interplay being for real. I wish more of the anthology's stories had taken their cue from Newlevant in not trying to be quite so literal or didactic about their involvement in gaming and focused a bit more on trying to create an interesting narrative. That said, I admire the anthology's undeniable sincerity, the variety of visual approaches, the general lack of slickness and/or overdrawing, and the way so many of the cartoonists were willing to share so much of themselves.